For most dogs, the most pleasurable part of riding in the car is feeling the cool breeze in their little faces as they put their head out the window. Despite how good and invigorating this feels, it’s very dangerous. Back in the “old” days, automobiles did not have windshields and their maximum speed was about 45 mph. At that time, drivers wore protective goggles to shield their eyes. Currently we have windshields to protect us from the outside elements and we wouldn’t think of sticking our head out the window while the car is moving. Then why do we let our dogs? Letting your furry travel companion stick his head out the window while driving is a very dangerous habit. Your dog’s eyes are exposed to dirt, stones, sand, and various other types of debris. This debris can very easily scratch or puncture your dog’s eyes. Pet goggles are now available for pets that help to protect your dog from such injuries…that is if you can train him not to paw them off. However, there are still many other dangers associated with letting your dog travel in the car with his head out the window. Damage to your dog’s ears is another big issue. 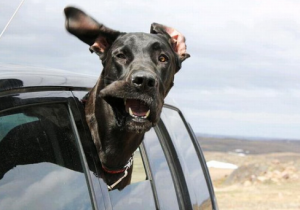 When your dog’s head is out the window, his ears will flap in the wind. This constant flapping of his soft earflaps can cause irritation and tenderness. Repeated trauma to the ear can cause swelling and can lead to lifelong ear issues for your dog. Allowing your pup to put his head out the car window can cause other, more serious outcomes. Dogs often times may fall out the window or get their head stuck in the window. If you’re driving a little too fast when you take a turn or traveling on a bumpy road, your dog may lose his balance and fall out of the window. Accidents like this occur more often than many think and can lead to serious injury or even death. Another very closely related dangerous pet travel habit is allowing your dog to ride in the bed of a pickup truck. A pickup truck bed offers virtually no protection from wind or debris. Further, it is very easy for your dog to fall out of this unsecured area, making it much more dangerous than dogs sticking their head out the window. Extreme heat is another issue associated with pickup truck beds. The pickup’s metal bed can reach dangerously high temperatures on hot, sunny days. The soft tissue on a dog’s paws can easily be damaged by such a hot surface. The back seat or cargo area of your vehicle is the safest place for your dog to ride – and they must be properly secured. A pet car seat, pet seat belt, travel crate, or vehicle pet barrier are among the best ways to secure your dog in your car. Safe travels! TripsWithPets.com is the #1 online resource for pet travel. Named best pet travel site by Consumer Reports, TripsWithPets.com’s mission is to offer resources that ensure pets are welcome, happy, and safe while traveling. The website features a directory of pet friendly hotels and accommodations across the United States and Canada, as well as airline & car rental pet policies; pet friendly restaurants, beaches, and events; a user-friendly route search option; pet travel tips; pet travel supplies; and other pet travel resources. Get 10% off your first order at TripsWithPets.com when you use coupon code: BARFWORLD2013 during checkout. (coupon code expires 12/31/2013). Pet Air Travel – Is Your Dog Safe When Traveling By Plane?